Why Buy from Sutton Ford Commercial & Fleet in Matteson? 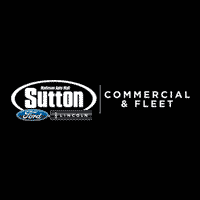 Sutton Ford Commercial & Fleet takes great pride in providing our commercial customers with the highest quality of fleet vehicles. We also offer a range of services to our customers that are traditionally not available from a dealership that does not have a department focused specifically on meeting the needs of their business customers. As a result, the experience Sutton Ford Commercial & Fleet provides is far above that of other options and has led to a number of partnerships between our company and others throughout the area. To see what Sutton Ford Commercial & Fleet can do for your business, browse our website or speak with a member of our team about your commercial fleet needs! Why Our Partners Pick Us? Each of these companies specializes in a specific area of commercial vehicle goods and services which are custom fitted to meet the needs of a specific company. Our partners work closely with us because they know the vehicles from Sutton Ford Commercial & Fleet are high quality. They are then able to complete the specific custom request and be assured the vehicle will perform the job the business customer needs. In addition, Sutton Ford Commercial & Fleet is able to provide our commercial vehicle customers with the option to service their vehicles at our location. This helps to ensure the vehicle is properly maintained or repaired. In addition, we are able to provide accurate estimates and help to reduce the downtime for businesses to get your vehicle back to work as quickly as possible.